Three poems of Byron / Graeme Koehne. Three poems of Byron / text from Byron ; music by Graeme Koehne. The Three Poems of Byron provide meditations on love in a setting for female voice and string orchestra. 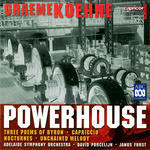 Written for the Adelaide Chamber Orchestra in 1993 the work was rearranged for the Australian String Quartet in 2007. The poems reflect, exquisitely, on the poet's appreciation of feminine beauty. The second of the chosen poems switches momentarily from the theme of beauty's praise to reflect upon the fickleness of woman. Contents note: Stanzas for music -- To woman -- She walks in beauty. 13 Nov 2016: at Albury Chamber Music Festival (Adamshurst Ballroom). Featuring Quartz, Sally-Anne Russell. 9 Aug 2014: at Nature | Jane Sheldon & Nicole Panizza (Elder Hall). Featuring Jane Sheldon, Nicole Panizza. 24 Jun 2014: at Zenith: Australian Melodies (Melbourne Recital Centre). Featuring Rhodri Clarke, Michael Lampard. 21 May 2011: at Fine Feelings And Grand Designs (Fitters' Workshop). Featuring Christina Wilson, Danish String Quartet. 21 May 11: featuring Danish String Quartet, Christina Wilson. A strong group of songs with a variety of moods and vocal demands that are arranged for voice and piano, voice and string quartet as well as voice and orchestra.